I live in Barrington, in the shadow of Willow Creek. I’ve long been familiar with the service they offer called, “The Practice”. As a youth worker in the ELCA, I’m intrigued by an evangelical community dabbling in a more liturgical style of worship. For that reason, I was excited to read Aaron Niequist’s The Eternal Current: How a Practice-Based Faith Can Save Us from Drowning. 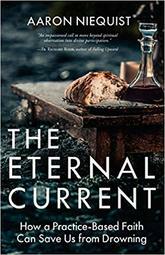 I was honored to receive a copy of The Eternal Current from Waterbrook Press and chose to review the book. All opinions are my own.